How Do You Spell TESSERA? 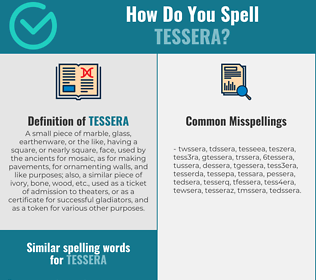 Correct spelling for the English word "tessera" is [tˈɛsəɹə], [tˈɛsəɹə], [t_ˈɛ_s_ə_ɹ_ə]] (IPA phonetic alphabet). Below is the list of 149 misspellings for the word "tessera". A small piece of marble, glass, earthenware, or the like, having a square, or nearly square, face, used by the ancients for mosaic, as for making pavements, for ornamenting walls, and like purposes; also, a similar piece of ivory, bone, wood, etc., used as a ticket of admission to theaters, or as a certificate for successful gladiators, and as a token for various other purposes.